We had such a huge brunch today that we ended up not having dinner and just snacking. I was going to fry up some buttermilk fried chicken for our Sunday dinner but the thought of something fried after this humongous meal just was not appetizing anymore. So I’m saving the chicken for tomorrow’s dinner. My husband who just love breakfast nearly swooned when he saw me putting this meal together. It was close to noon and we hadn’t had anything to eat but coffee and the girls were just getting out of bed. I decided to clean out the refrigerator. I took out sausage, liver pudding, and bacon. There was also some greens left over from Friday’s dinner so why not? Why not have some veggies to balance out all these fattening meats, right? Besides, it was sinfully good. 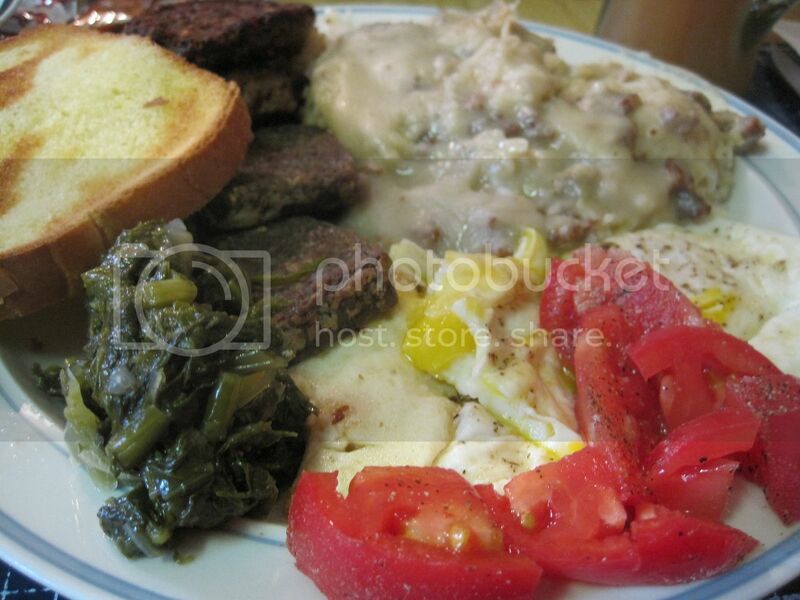 Midway to cooking breakfast, my husband nonchanlantly mentioned, “It would be nice to have some sausage gravy“. Well the man has been working hard, I figure, why not? So I made him gravy too on top of everything else. So this was his plate and on it is: Neese’s ‘hot’ sausage patties, Neese’s Liver Pudding, 2 eggs over easy, and garlic fried rice smothered in Sausage Gravy. Along the side are some sliced tomatoes, some leftover greens and toast. He was a happy man!